This entry is part 7 of 23 in the series Portugal & Andalusia 2012. With its brightly painted tile walls and elaborate mural ceilings, the Sintra National Palace, is well worth exploring on a day-trip from Lisbon, Portugal. One of the most fascinating and beautiful places we visited on our recent trip to Portugal and Spain, was the town of Sintra, not far from the capitol, Lisbon. Sintra, nestled in the mountains, was a playground for the rich and famous of Portugal from the 15th to the 19th centuries. The wealthy tried to outdo each other with their elaborate estates, castles and gardens. Many of them are now restored and open to the public. 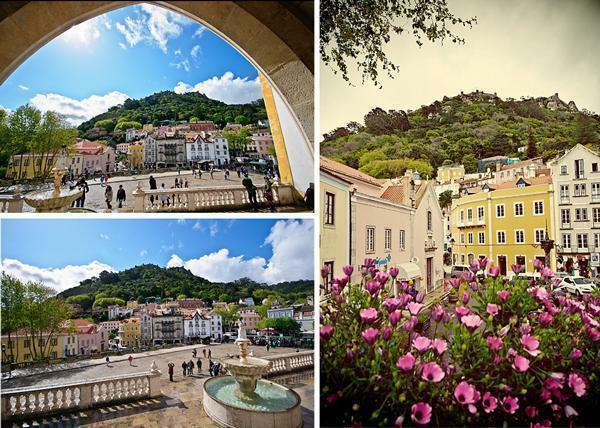 Sintra was designated a UNESCO World Heritage site in 1995 and is a Mecca for day-trippers from Lisbon. Tour buses chug up the narrow mountain roads and visitors parade through the town. We decided to spend the night in Sintra and see what the fuss was about. During our stay, we visited 3 palaces: the Sintra National Palace, the Pena National Palace, and the Monserrate Estate. Today we’ll explore the first of these incredible buildings, the Sintra National Palace. The facade of The Sintra National Palace with the 33 metre chimneys visible in the back. 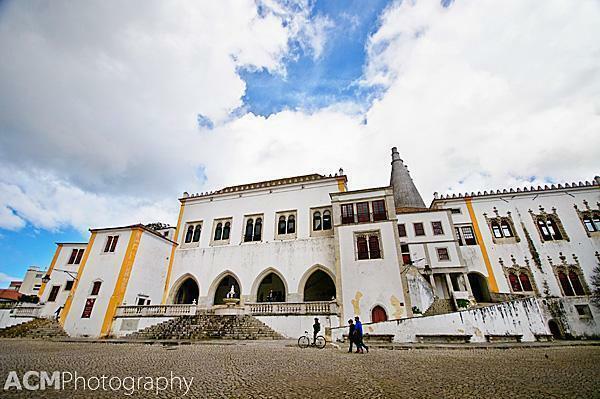 The Sintra National Palace is located in the town centre. Although there is evidence a palace existed on the site in the 10th century, the current Sintra National Palace is a mixture of Gothic, Manueline and Moorish styles from the 15th and early 16th centuries. The stark white palace is less ornate than many of the other palaces and estates nearby and is dominated by two enormous chimneys rising 33 metres over the kitchen. The design and decoration of the palace’s interior was sponsored by King Manuel I with wealth acquired during the Age of the Discoveries. 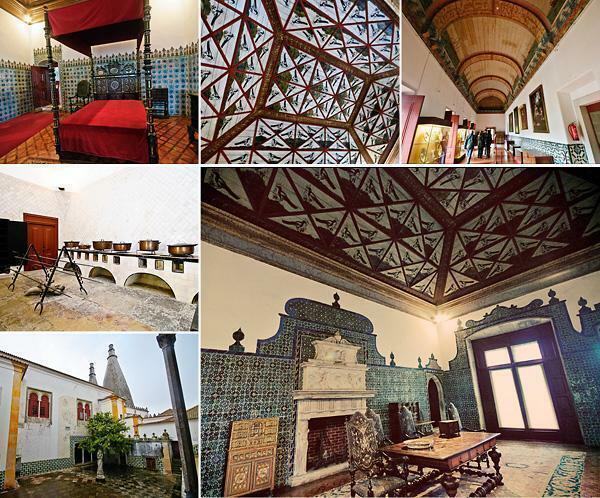 He ordered unique hand-crafted tiles from Seville to decorate the walls of most of the rooms and had many of the ceilings painted with elaborate frescoes. 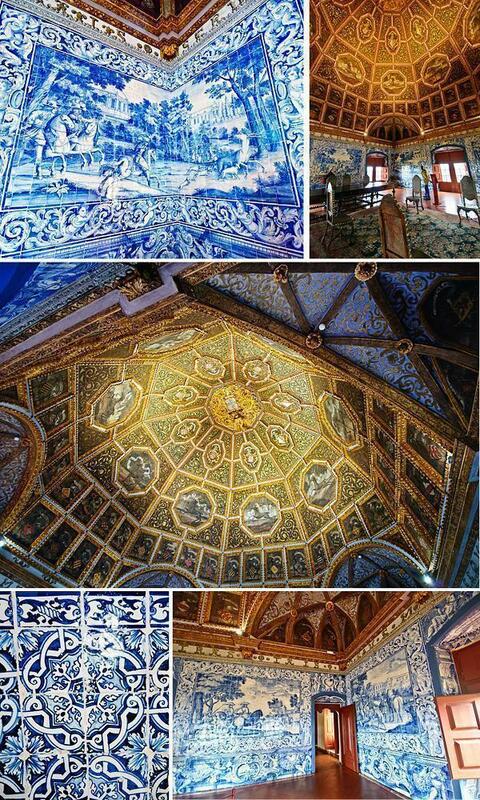 The most elaborate and breath-taking room in the Sintra National Place is the Sala dos Brasões, the coats of arms room or Blazons Hall. This room is decorated in striking blue and white tiles, or Portuguese Azulejos , depicting hunting scenes. 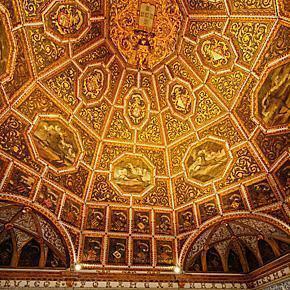 The domed ceiling is decorated with the coats of arms of 72 Portuguese royal families. 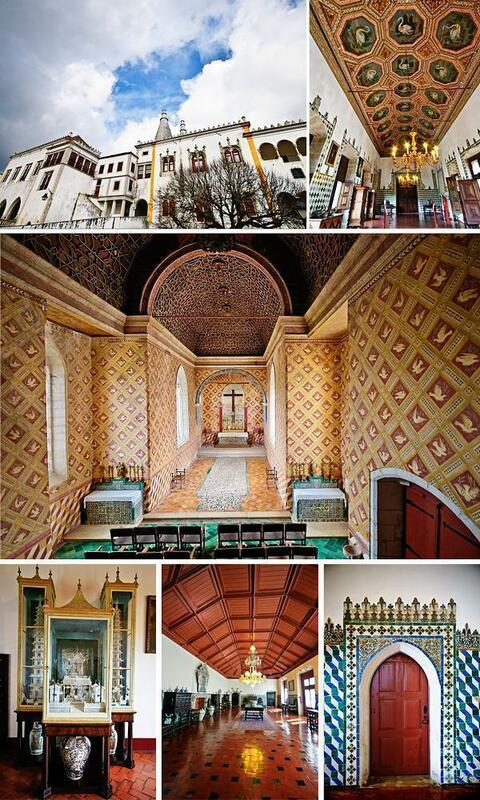 Other impressive rooms include the Magpies Hall, the Swans Hall, the Arab Room and the Palatine Chapel. It’s hard to walk around the Sintra National Palace without getting a crick in your neck from staring at the incredible ceilings. Outside the main entrance of the palace, you can see the colourful houses of the town of Sintra, presided over by the ruin of the Castelo dos Mouros, or Castle of the Moors, on the mountaintop above. Stay tuned as we explore two more beautiful palaces of Sintra, Portugal in upcoming posts.